Village series kukris are kukris Nepali farmers use them all over Nepal for their daily cutting and chopping task. Nepal being a agricultural country needs this perfect chopping tool for almost everything, from chopping firewoods to branches, clearing bushes to into muddy paddy fields, to building houses to building dams and even into the kitchen for their domestic use. They are also very important to keep one while travelling one village to another. However these village kukri differ from one village to another as different blacksmiths have their own fordging and designing so why the name differs also. Sizes too make huge difference when its affectness is concerned. Smaller sizes are used for smaller task and longer heavier ones are used for heavier task. 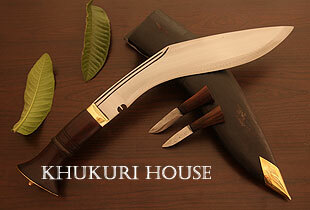 Famous village Khukuri "Bhojpure" just made 2 inches longer and with unpolished finish for rough use. A perfect cutting tool if you love farming.